On The Frontlines of the Television War is the story of Yasutsune "Tony" Hirashiki's ten years in Vietnam—beginning when he arrived in 1966 as a young freelancer with a 16mm camera but without a job or the slightest grasp of English and ending in the hectic fall of Saigon in 1975 when he was literally thrown on one of the last flights out. His memoir has all the exciting tales of peril, hardship, and close calls as the best of battle memoirs but it is primarily a story of very real and yet remarkable people: the soldiers who fought, bled, and died, and the reporters and photographers who went right to the frontlines to record their stories and memorialize their sacrifice. 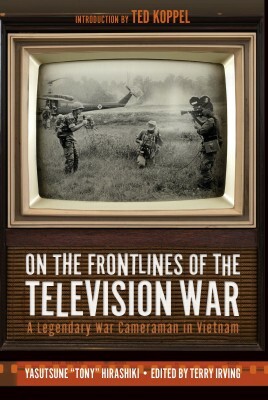 The great books about Vietnam journalism have been about print reporters, still photographers, and television correspondents but if this was truly the first “television war,” then it is time to hear the story of the cameramen who shot the pictures and the reporters who wrote the stories that the average American witnessed daily in their living rooms. An award-winning sensation when it was released in Japan in 2008, this book been completely re-created for an international audience. In 2008, the Japanese edition was published by Kodansha in two hardback volumes and titled "I Wanted to Be Capa." It won the 2009 Oya Soichi Nonfiction Award-a prize usually reserved for much younger writers—and Kodansha almost doubled their initial print run to meet the demand. In that period, he was interviewed extensively, a documentary was filmed in which he returned to the people and places of his wartime experience, and a dramatization of his book was written and presented on NHK Radio. A Kodansha paperback was published in 2010 with an initial printing of 17,000 copies and continues to sell at a respectable pace. Yasutsune "Tony" Hirashiki was an ABC News cameraman from 1966 to 2006. In those four decades he became legendary, consistently known as the best cameraman in the company and certainly the guy you wanted next to you if you were walking into danger. During his time in Vietnam, he was present at virtually every major event. Since then he has worked in danger zones around the world. "This is a particularly important book for Americans to read." "If I could choose one book about Vietnam, it would be Tony Hirashiki's story. He brings you in intimate contact more than anyone else with the grunts who fought this war and the guys who reported it!" "A candid portrait of a master cameraman. 'On the Frontlines of the Television War' takes you through the danger, death, and poignancy of the battlefield. Vivid, intimate, and heart-wrenching." "Packed with photos and reminiscences from many other news crews, "On the Frontlines of the Television War” tells a story I'd not heard before. Reading this book took me back to my childhood, watching the evening news. But now I know the effort and at times the human cost it took to bring those images to American living rooms." "There is a tendency as we approach 2020 for us to assume that everything that occurs on our planet will be recorded for us for instant replay via television or social media. It's an aspect of the modern world that was forecast in children's SF comic strips back in the 1950s, along with regular spaceflights to and from the moon and Mars, which clearly didn't happen but may now be just around the corner... This superb book looks at how we reached this point in TV reporting, and is well worth a few hours of your time." "If there were no pictures in this at all, it would still be a great read and an incredible insight into the life of a ‘non-combatant' in a brutal war.” "